Current: EXTREME PREVIEW BOOK OFFERED FREE! EXTREME PREVIEW BOOK OFFERED FREE! Berkeley, CA â€“ 19 October 2011 â€“ Beginning today, a gorgeous full color preview book of several recently announced Extreme titles is now available online for free at ImageComics.com. 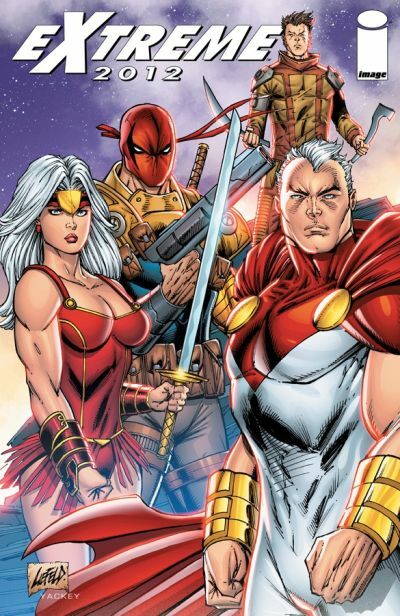 The printed Extreme Preview book was debuted this past weekend at New York Comic Con, when the publisher announced the return of several original titles that were created by a talented and prolific young Rob Liefeld (Deadpool, YOUNGBLOOD, THE INFINITE) in the early 1990s. Joining Image for the return of these Extreme titles are some of the best and brightest talents of the comics business today, including Brandon Graham and Simon Roy on PROPHET, Joe Keatinge and Ross Campbell on GLORY, Alan Moore, Erik Larsen & Cory Hamscher on SUPREME, Tim Seeley and Francheco Gaston on BLOODSTRIKE, and John McLaughlin, Jon Malin, and Rob Liefeld himself on YOUNGBLOOD! Liefeld continued: “The work of Brandon Graham and Simon Roy on PROPHET is a revelation to behold! It is a stunning new vision of a man out of time and place. GLORY by Joe Keatinge and Ross Campbell is simultaneously gorgeous and vicious. It leaps off the page, and re-introduces a bold heroine truly unlike any in comics right now! BLOODSTRIKE by Tim Seeley and Francheco Gaston is a cool, smart, savvy action yarn—Mission Impossible by way of Universal Soldier. It’s guns blazing, immortal soldiers that are definitely keeping score! YOUNGBLOOD by Black Swan scribe John McLaughlin, myself and Jon Malin is a 21st century face lift that boasts a wild, imaginative new direction for the book that launched Image Comics! “And finally, SUPREME returns after a 12-year hiatus with superstars Alan Moore and Erik Larsen at the helm. Finishing Alan’s story has been the single biggest fan demand of the last decade, and Erik Larsen and Cory Hamscher finish it off in style and embark on the boldest, most controversial Supreme epic ever! Having seen the first three issues, I can tell you that Larsen is having the time of his life with this book, combining elements of my run and Alan’s run into one twisted tale! The Extreme Preview book will also be available for free at Image Comics’ digital partners, ComiXology, Graphicly, iVerse, and Diamond Digital. The first release from this impressive lineup to hit stores will be PROPHET #21, debuting on January 18, just in time to kick off Image Comics’ 20th Anniversary year, and will be available for order in the November issue of Previews.